← Taking liberties- Who picks up the mess? Some might say that the Rattlechain Brickworks and the man who operated them were cursed. Even in the days before any health and safety legislation- (we know that Samuel Barnett had lost an arm at the nearby Stour Valley Brickworks), calamity appeared all around the chain. The 1899 bursting of the banks and emptying of 7 miles of canal into the 100 yards deep marl pit is well documented. Not so well known are the deaths of two men, who were working on heightening the brickworks stack in 1906. This post deals with another serious accident between the two World Wars at the brickworks, and interestingly gives an account of when they were still operating. Position of the former Rattlechain brickworks superimposed on the current lagoon site. 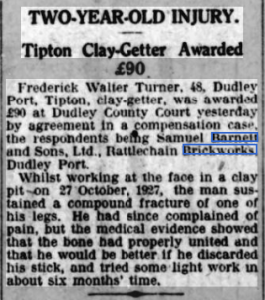 From The Birmingham Daily Gazette of 7th March 1930 we learn that A Tipton man- Fred Turner was given a £90 compensation payment after breaking his leg three years earlier whilst working on the face of the pit. By now Barnett himself was dead, but his sons had obviously taken over the business. 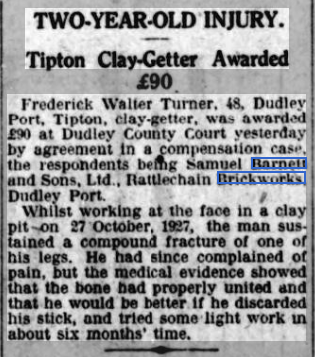 One wonders if the delay in payment and the long layoff of poor Fred was due to the litigious nature of this company and The Barnett’s in attempting to avoid blame. A job or business with them was a risk not really worth taking.